· The dialog in Figure 6 will appear. 2. You may select the desired sort field by clicking the appropriate TAB at the Top of the Dialog (A). 4. You may purge the History file by clicking "Purge History" (E). · You'll be presented with a dialog allowing you to designate the Number of Days old a listing must be in order to be purged. At times it may become necessary to Edit/Change the spelling of a Performer's Name, possibly due to an original misspelling. 1. Enter the "Current Name" as currently contained in the History list. 2. Enter the corrected "New Name". 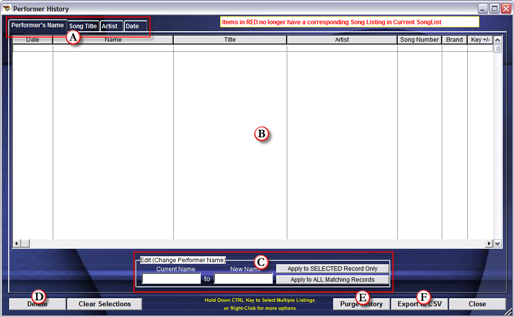 · "Apply to SELECTED Record Only"
This will apply the change to the SELECTED Record ONLY. · "Apply to ALL Matching Records"
This will apply the change to ALL History Records matching the "Current Name" as provided in step 2.